Eastern Slope Alkaline LakesEastern Slope Alkaline Lakes are below 10,000 ele. with a pH of 7.5 to 9.5, which is an optimum pH for fish habitat. They are located in arid semi-desert environments along the eastern slope of the Rockies. They are high in nutrients with shallow flat feeding areas and extensive weedbeds. The high pH increases the clarity of the water and sunlight is able to penetrate up to 40-50 feet, increasing weedbed activity. The lake bottom is volcanic in origin with plenty of mud and silt. Usually spring creeks are associated with the lakes supplying cool, highly mineralized water. The lakes will have seasonal algea blooms as the temperatures rise during the summer. The fish are usually Rainbows and Browns that will generally feed upon a resident food supply of leeches, snails, scuds, and baitfish. Intensive hatches will also occur such as Chironomids and Damselflies. 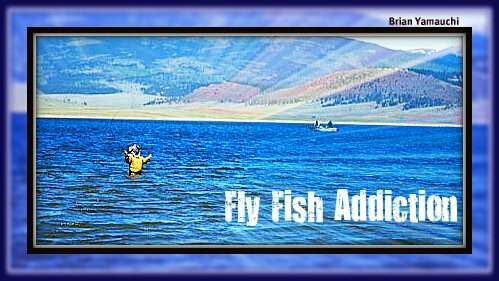 The lakes are ice-free from May through November allowing for a longer growth period for the fish..
As the surface temperatures of the lake warm, the lake will stratify into two temperature zones separated by the thermocline. 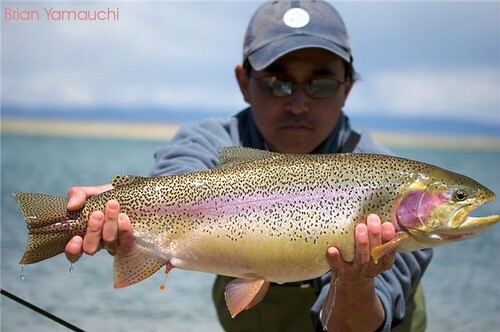 The trout will tend to seek those areas with the right temperature requirements and areas that provide both cover and forage. Often, this will be within a middle depth feeding area. Daphnia blooms will often occur within these depths and the trout will feed upon them exclusively. This can go on for about 2-3 weeks.